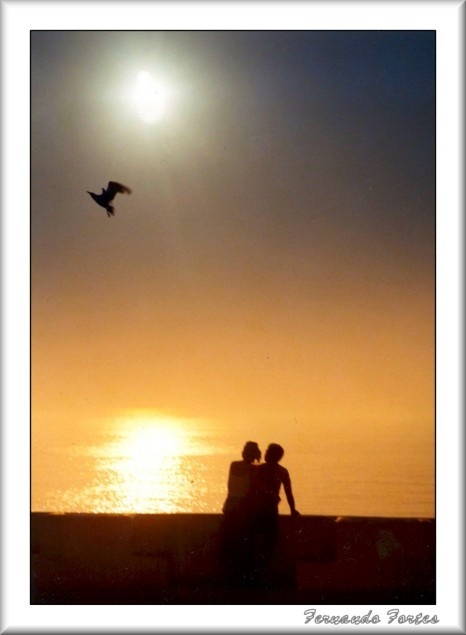 Фото "Moments in Time... forever"
Photo in Portugal (Zambujeira do Mar). A long wait until the right moment. Some moments are forever... Life should be like this, simple, soft and with love. A beautiful backlighting. Perfect silhouettes. I love this photo. Congratulations, Fernando C. Fortes. Interesting idea.Excellent on mood and composition. A nicely romantic shot. The bird is a delicious touch! Lovely silhouettes and colors. Que olharгo eles? O cair da tarde ou o voo melancolico da gaivota?